I've wanted to do a flying geese motif pretty much since I began quilting. I admire the classic (and okay, traditional) pattern every time I see it, even if I hate the fabric or find the overall interpretation slightly boring. I love the motion, the movement. Back in September, when I made a list of three things I wanted to do while I am twenty-five, one of them was to make myself a flying geese quilt. This quilt is what I used as my color inspiration, as I continued to obsess over it for weeks after I saw it on Pinterest. I think I did a pretty good job finding the right tones to imitate, considering I bought all the solids on Fabric.com, because I need to have my Kona solids, and they have the largest selection. That's not a true black, it's Kona Pepper, and the creamy white is the all-time most perfect tone of white: Kona Snow. I actually thought I had missed the mark a lot more, until I put these photos up next to the one below. Love! So now I just need to decide how to arrange it all. I like these flying geese, but I don't love them yet. 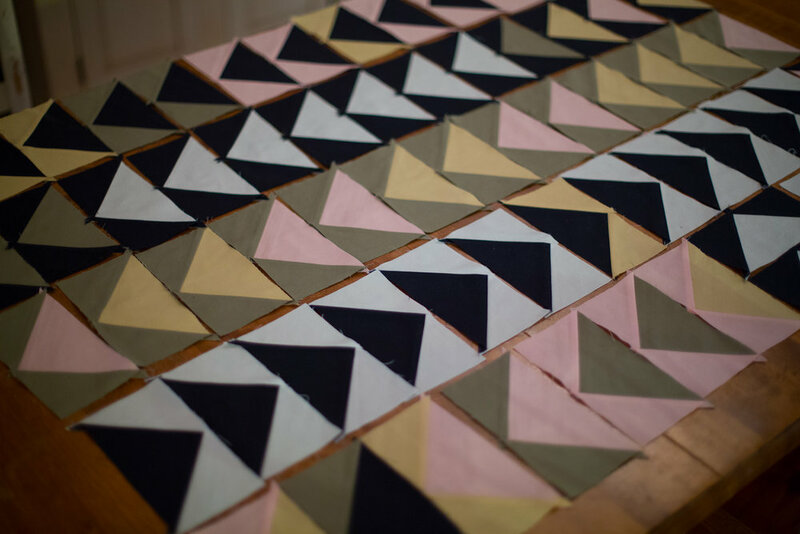 I am pondering adding some half-square triangles into the motif, because I love the way multiple directions of points and triangles play off one another in a quilt. I will at least make some and see how I feel about it. Later on this year, when I finish the quilt top, I have decided to hand-quilt this one. I've made enough quilts at this point where I don't feel a great need to churn them out. However, I do feel a need to be creating something, working on something beautiful. So if I make this take a long time, I won't be in such a hurry to move onto the next project. It means this quilt will probably take me into 2014, actually. Yikes! But I think I should learn the patience, and the techniques. And I love the way the stitches look, their texture and imperfection. What are your favorite flying geese or other triangle patterns and motifs? Do you have a favorite interpretation, that you or someone else has made? What tips do you have on hand quilting, or what tutorials helped you the most? Do you have any suggestions on how to arrange my flying geese to help me fall in love with them? I know there is great potential here, I just have to let it arise, in time. I'm letting it stew here for awhile. In the meantime, I have a novel to write in my spare time.